No one likes loud and scary things and neither do our dogs. Helping our dogs to understand that even though something is noisy it doesn’t mean that it is going to hurt them. Teaching our dogs to accept and get over these type of objects can help them to become calmer and more relaxed both in the home and out in public. Now Maddie and Shannon enjoy going for walks. Shannon brought Maddie, her Golden Retriever, to us because Maddie was afraid of large utility trucks and did not want to go out for walks. After doing our Board and Train Program and in-home sessions with her owners, Maddie was able to get over her fear and not react to loud, scary noises. Now family members can bring their dogs over and everyone can have a good time. Sandy contacted us about her Siberian Huskies, Sheena and Savannah. The dogs were destructive in the house, eating off of counters and not getting along with other family members’ dogs. We put Sheena and Savannah through our ten week in-home program where we taught them to calm down and listen to their owners. We were also able to teach them how to interact with other dogs politely. Now Stephen doesn’t worry that Coal will run away or get lost. Stephen asked us for help with Coal, an American Staffordshire Terrier (Pitbull) who at ten weeks old, needed help with learning puppy manners like coming when called and not chewing on things that were not his toys. Stephen wanted to be able to take Coal on outdoor adventures with him. Coal was in our six week puppy training program. We took Coal and Stephen to parks and pet stores to work on coming when called. Now Coal is a polite adult dog who enjoys being out in public with Stephen and Stephen doesn’t worry that Coal will run away or get lost. Now he walks nicely on a leash and comes when called. Ed’s puppy, Charlie, a Chocolate Labrador Retriever was chewing lamp cords and would howl whenever Ed put him in the crate. Charlie was in our Board and Train Program. We helped fix Charlie’s fear of the crate by using Nike, another dog boarding with us who loved her crate, to show Charlie the crate was not a scary or bad thing. We also worked with Charlie in his own home on learning good manners like walking nicely on a leash and coming when called. Charlie is now a happy dog who enjoys going on hikes in the mountains with Ed. Jane is excited to be able to buy new furniture and not worry that it will be destroyed. Jane’s dog, Max, an American Staffordshire Terrier (Pitbull), needed help because he would get so stressed out when Jane went to work that he would rip her couch to shreds. After Max destroyed four couches Jane knew she needed help. Max came into our six week in-home training program. We worked with Jane on how to use the crate while she was at work so Max could not destroy her furniture and he felt safe when she was gone. Now Leo is able to enjoy mealtimes and so is his family. Megan brought Leo, her Yellow Labrador Retriever, to us because he was chewing window blinds and furniture when she was at work. He also would steal food off of the table and counters. We had Leo in our six week in-home training program where we worked on getting him to accept being in the crate while Megan was at work. We also worked on his stealing food by teaching him to be in a specific place during mealtime. After only four lessons Magnolia was able greet people…. Stacy came to us about an issue with her six month old Golden Retriever, Magnolia, who would pee in the house when she was excited. She got excited whenever her owners returned home or when people came over to the house. In fact, when we first met Magnolia she got real excited and peed all over the floor. We put Magnolia in our private Puppy Program. After only four lessons Magnolia was able greet people at the door without getting too excited and without peeing. Stacy is really happy that she can have company over and everyone can enjoy Magnolia. Emma came to us as a referral through another trainer, Myra. Emma had already been trained in basic manners, but was too energetic and excited around other people and dogs to be a service animal. She needed to be placed in a new home, but first needed help learning how to be a family dog. She was placed in our board and train program where she learned to politely greet people when they came in the home and learned to play nicely with other dogs. She was adopted into a home with a very active owner and was included in outings and family activities. She now enjoys quiet time with her family as well as playing happily with them. 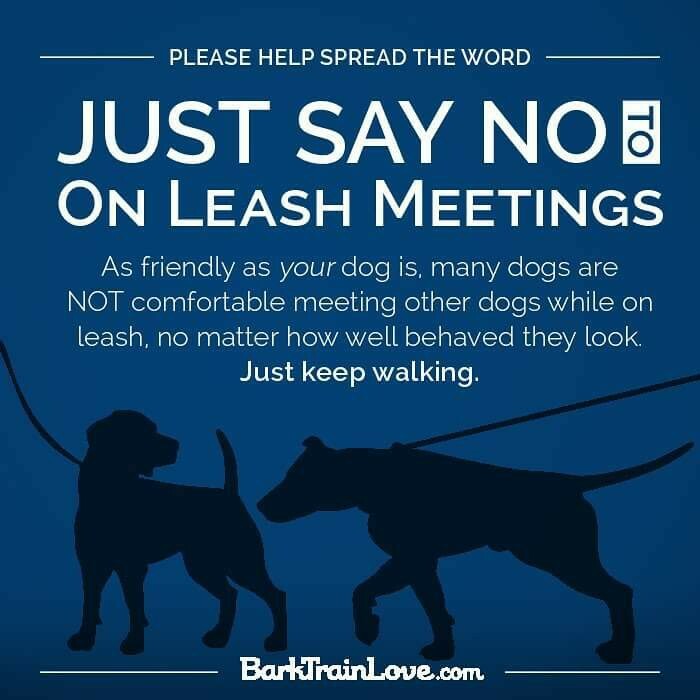 Is It a Good Idea to Let My Dog Meet Another Dog on Leash?